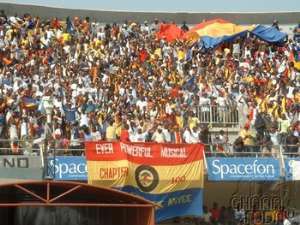 Accra, Jan 4, GNA - The first leg CAF Confederation Cup finals match between Accra Hearts of Oak and Kumasi Asante Kotoko played at the Ohene Djan Sports Stadium in Accra last Sunday grossed a total of 906.9 million cedis. A source at the National Sports Council (NSC) who disclosed this to the GNA Sports said the amount is one of the highest gate proceeds to be recorded at the stadium in recent memory. The source said that even though the stadium was not filled to capacity, the amount was realised because there was an increase in gate fees and strict security checks. The match, which was the first continental cup match between clubs from the same country finally came off on Sunday after the earlier proposed date by CAF was rescheduled in view of the its closeness to Ghana's last December general elections. The source however said that even though the amount might look huge by any estimation, the cost of organising the event to ensure that nothing nasty happened and that the match took place without any incident could easily take a huge chunk of the money. It said the NSC alone spent so much including the repair of the stadium score board and fixing of new exit gates around the stadium to ensure that in case of any eventuality supporters have a safe passage. "When one considers the cost of the security set up for the match, which was made up of more than 1200 police officers and men and 200 military personnel it would push the cost of hosting into several million cedis". The match, which ended one all saw the visitors take a second half lead after the hour mark after Kotoko's striker, Michael Osei scored from a rebound after a free kick by Charles Taylor. Hearts equalised in the dying embers of the game courtesy a low drive by Hearts Louis Agyeman to set up a pulsating encounter next Sunday at the Kumasi Sports Stadium in the return encounter.